My baby...is crawling, and her first tooth has poked through! What is happening? Meres will be 8 months in a week. I can't believe how the time has flown. She now follows me around, tapping my legs to get me to pick her up. And while her tooth is just breaking through, soon she will have that cute, and sharp, toothy baby grin. It makes me nostalgic to see the days passing so very quickly. We had a wonderful weekend. 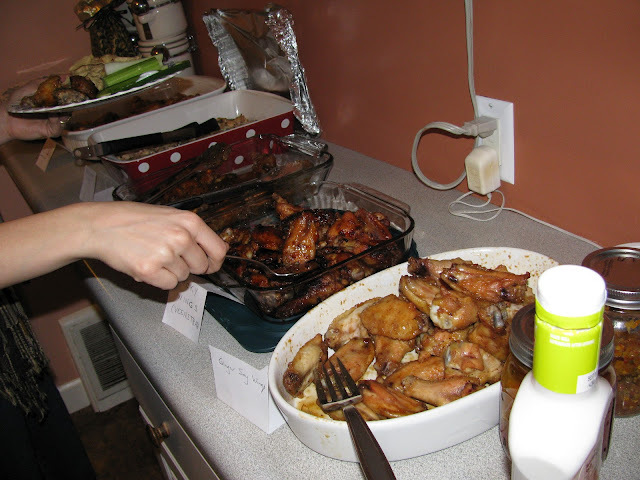 Saturday we had a passel of friends over for a wing night. It was Brian's idea...invite our friends who like wings or like to cook, and we'll see what we end up with. 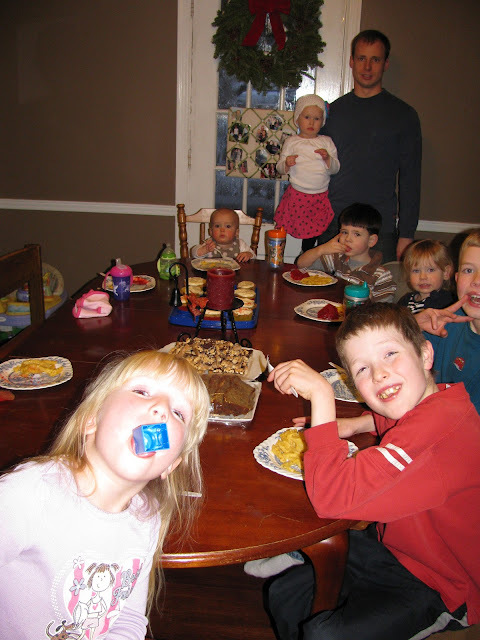 He adapted the name from Buffalo Wild Wings (Veenstra Wild Wings-VW3s), and I did the rest.=) We invited 20 adults, and 15 (eating) kids, plus 3 non-eaters. And our house was bursting at the seams. I think 15 adults came, and almost 15 kids. It was chaotic, and great fun. Each couple was responsible to bring 4 pounds of any kind of wings, plus a side or dessert. We ended up with 7 or more types of wings. There were Asian zing, lemon wings, sticky wings, Frank's red hot, deep fried, honey barbecue, teriyaki, and others. (I can't remember what the Henning's exact contribution was-I should have saved the cards-but I know I liked them) Everything was amazing! 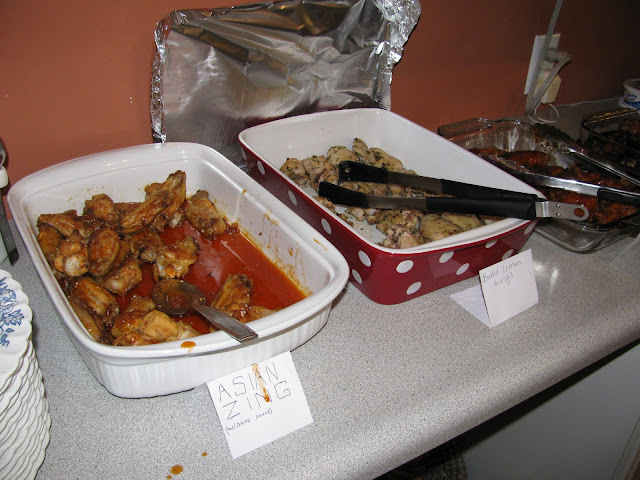 I think that the deep fried wings were the hottest, though the Asian zing wings had a bite too. Mine had a bit of cayenne, but they were actually pretty mild. I enjoyed the lemon ones. They had great flavor, and were unique amongst the offerings. Casey made an unbelievable pico de gallo. It had avocado, corn, beans, and tomatoes, among other things. It was fresh, and delicious! Brian and I put together some jalapeno poppers. We had tried this recipe for Christmas. It has fresh cilantro, monterey jack cheese, bacon and cumin. Easy and flavorful. Of course, it being a Hippie get together and all, there were several great desserts also. There was a chocolate cheesecake, a chocolate lady finger dessert, cupcakes, sweet bread, toffee, and these cool pretzel/hug/m&m things I found on Pinterest. -Stir 1/4 cup of sugar, 1 Tbsp soy sauce, ginger, garlic, and 1/4 tsp cayenne in slow cooker. Season chicken with salt and pepper, add to slow cooker, and toss to coat. -Cover and cook until chicken is tender, about 4 hours on low. -Heat broiler to high. Place wire rack in aluminum foil lined baking sheet, and spray with cooking spray. Transfer chicken to prepared baking sheet. Discard braising liquid. -Combine remaining 1/2 cup sugar, water, tomato paste, remaining 3 Tbsp of soy sauce, and remaining 1/4 teaspoon of cayenne in a bowl. -Brush chicken with half the mixture, and broil until lightly charred and crisp, 10-15 minutes. -Turn chicken, coat with remaining sauce and return to broiler until lightly charred and crisp on second side, 5-10 minutes. Serve. I'm thinkin' we've got a case for an annual VW3s!